Jack Hilborn poses with the Wayne Hilborn Lifetime Achievement Award, which he received from the Delaware Area Chamber of Commerce on Monday. The award is named after his late father, Wayne Hilborn. Jack Hilborn, however, has done just that. 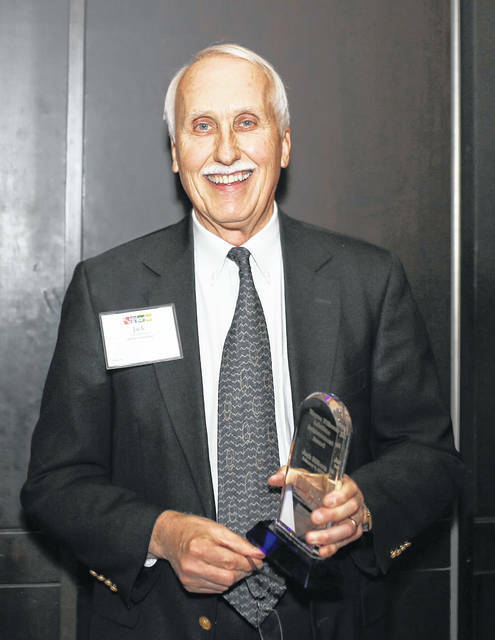 In front of a packed ballroom inside the Hilton Columbus/Polaris on Monday, Hilborn was invited to the stage during the Delaware Area Chamber of Commerce’s annual dinner and awards ceremony to present, so he thought, the Wayne Hilborn Lifetime Achievement Award. Originally named the Honor Citizen Award, the award was renamed the Wayne Hilborn Lifetime Achievement Award in honor of Hilborn’s late father, who passed away in November 1994. After explaining the significance of the award, Hilborn was about to announce the winner when his son, John Hilborn, stepped on stage. Still unaware of what was going on, Jack Hilborn suddenly realized the gig was up, and he was the 2019 recipient of the award. Chamber President Holly Quaine said for several years, she has quietly thought to herself that “no one exemplifies the Wayne Hilborn Award more than Jack.” Knowing how “humble” he is, and “how much he wants to make clear that the award is not chosen by the Hilborn family,” Quaine never brought up to the Chamber Board the thought of recognizing Jack Hilborn with the award. After learning she wasn’t the only who felt that way, Quaine went to work planning the surprise. As his son told the crowd about the “few ways dad has supported the Delaware community over the years,” the smile on Jack Hilborn’s face said it all as he stood near his son holding the award named for his late father. Born and raised in the city of Delaware, Jack Hilborn graduated from Rutherford B. Hayes High School. Upon graduation, he began not only a successful career as a business owner, but also a lifetime of giving back to the community. As he stood at the podium, John Hilborn read off a lengthy list of positions his father has held or currently holds: Member of the Rutherford B. Hayes Memorial Committee, member of the Delaware City Schools Facilities Committee (over 30 years), volunteer on a number of the schools’ levy campaigns, member and former chair of the Healthcare Foundation of Delaware County, former member and vice president of the Grady Memorial Hospital Board, former chair of the Grady Hospital Bioethics Committee, current member of the Grady Hospital Advisory Committee, current co-chair of the Strand Theatre Capital Fund Campaign, longest-continuing current member (over 25 years) of the Delaware County Historical Society and current board president, member of the William Street United Methodist Church for over 50 years, 1975 charter member of Delaware County Kiwanis Club, and past governor of the Ohio district of Kiwanis International, where he’s held numerous leadership positions over the years. After listening to his son talk about his list of accomplishments and contributions to the Delaware community, Jack Hilborn, who said there has only been a few instances in his life where he was speechless, was exactly that. The significance of the moment, however, was not lost on Jack Hilborn. Many people who live or work within the Delaware community, like Quaine, believe Delaware is what it is today because of people like Jack and the late Wayne Hilborn.